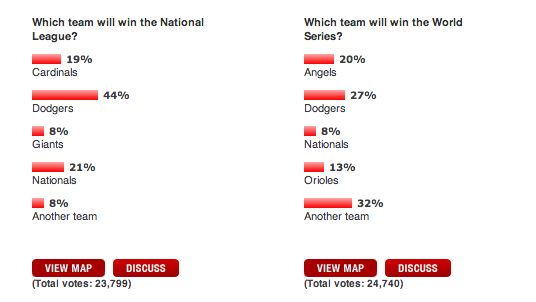 Screenshot taken from ESPN.com's Sportsnation poll, Sunday Sept 21, 11.43p PT. Superstitious much? Besides, polls are dumb. Puig: Perfectly Poised, Or Perilously Primed? Post-Game 154 Thread: Postseason Bound! PLAYOFF TICKETS ON SALE - NOW!!!!!! Post-Game 153 Thread: Good Dodgers!